The North Face Base Camp Duffel has been my airline go-to that has been so adaptable it’s almost chameleon-like. I can fit so much content in this medium sized bag by North Face that it’s borderline preposterous. The key is the flexibility of the material. Because it is not static like a rolling luggage piece, it is versatile in what it can hold – even though it may be “bigger” than the dimensions typically allowed. It has held a weeks worth of clothing and gear for trips. The only caveat to the space is that the size is precariously close to what is commonly accepted by airlines. I have been asked to check it on 2 occasions because of size – but I simply insisted that it had been allowed on previous flights and was granted permission to store it overhead. The key that allows it to fit in the overhead bins is its flexibility. It is marginally large when fitting in the overhead only if it is packed – but because of the material, it usually slides in ever-so-nicely. The North Face Base Camp Duffel Bag has also been all over the country – to the Caribbean – Europe – Africa – and survived the puppy that our malicious friends gave my roommates and I. 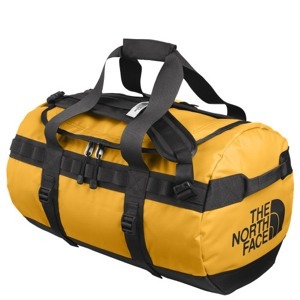 The North Face has designed this bag with lots of features. It repels water well, the material is fundamentally durable, and has bomber zippers (protected from wear and the elements by a flap). You can also wear it three ways: backpack, carry it by hand, or (my favorite) elongating the shoulder straps and carrying it by both of them over the shoulder. The only problem that I’ve run into with this bag is that although almost everything washes off this bag – if you neglect washing it regularly, it can stain. So, avoid negligence and treat this bag well and it should guide you through any number of trips. Taken care of well and used liberally – the North Face Base Camp Duffel a useful bag that should last many years, trips, and circumstances.